182 pages | 11 B/W Illus. Assistive technology for cognition is technology which can be used to enable, enhance, or extend cognitive function. This book systematically examines how cutting-edge digital technologies can assist the cognitive function of people with cognitive impairments, with the potential to revolutionize rehabilitation. Technologies are reviewed which direct attention, remind, recognize, prompt, and generally guide people through activities of daily living. 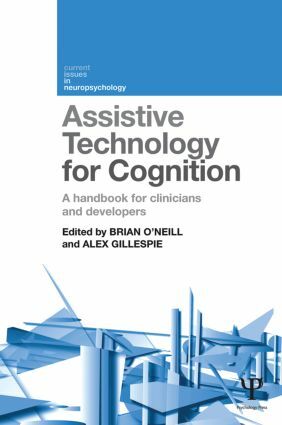 Written by experts in neuropsychology and technology development, Assistive Technology for Cognition provides a comprehensiveoverview ofthe efficacy of technologies to assist people with brain impairments. Based on the list provided by the International Classification of Function, each chapter covers a different cognitive function; namely, attention, memory, affect, perception, executive function, language, numeracy, sequencing, and navigation onto which existing and future assistive technologies for cognition are mapped. This structure provides in-depth research in an accessible way, and will allow practitioners to move from an assessment of cognitive deficits to the prescription of an appropriate assistive technology for cognition. The chapters also make suggestions for future developments. Assistive Technology for Cognition will be of great interest to clinicians and researchers working in brain injury rehabilitation, technology developers, and also to students in clinical psychology, neuropsychology, and allied health disciplines. Brian O'Neill is a Consultant in Neuropsychology and Rehabilitation with the Brain Injury Rehabilitation Trust, Glasgow, and Research Fellow at the University of Stirling, UK. Alex Gillespie is Associate Professor in Social Psychology at the London School of Economics, UK.